By the time France had finally been defeated in America by the British forces in 1763; there had been 6 wars in the colonies, generally referred to as the colonial wars. These wars were conflicts between New England and New France, along with various Native American tribes who had ties with the Europeans. The first of these colonial wars was King William’s War, which lasted from 1688 to 1697, also called the Nine Years’ War, the War of the League of Augsburg, or the War of the Grand Alliance. At the time of King William’s War, the conflicts in North America were not seen as changing the relative power positions of either country in the European theater. New England forces had attempted expansion into an area of southern Maine known as Acadia, but had been stopped by New France, along with their Native American allies in the Wabanaki Confederacy. 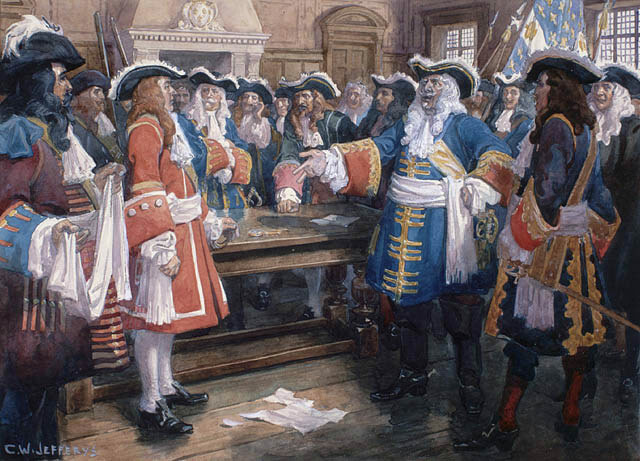 The end result of this conflict was the 1697 Treaty of Ryswick, under which the borders of territories previously claimed by New York, New France, and New England stayed the same as before. At the end of 1688, the English King James II fell from power in what is called the Glorious Revolution. Subsequently, the throne was occupied by William and Mary, Protestants in contrast to the former Catholic King. Upon gaining the throne, William decided to collaborate with the League of Augsburg in the war with France. In 1686, New England’s colonies and those of New France had formed a union called the Dominion of New England. Two years later the union was in disarray, and the drums of war were sounding between the two contingents. On their side, New England had the Iroquois Confederacy, while New France had made an ally in the Wabanaki Confederacy. War between the two began in earnest when the Iroquois, who were in control of the lucrative fur trade in the Great Lakes area, at the behest of New England, forcibly stopped the free flow of fur trade between New France and tribes further west. After a retaliatory strike by New France in the area of western New York held by the Seneca tribe, New England and their Iroquois allies mounted an attack and raided the settlement of Lachine. Conflicts were also simmering along the border shared by Acadia and New England in Maine. An expansion of English settlements into the New France-controlled Acadia had raised tensions and caused ill feelings. In a strategy designed to consolidate the claim held by New France on what is today Maine, Catholic missions were founded and located in three of the largest native American settlements in the area. The Wabanaki Confederacy was the result of the bonding of 5 Acadian tribes after King Philips’ War. They wanted to create a political and military relationship with the forces of New France in order to put a halt to the expansion efforts of New England. The border between Acadia and New England was the scene of the beginning sorties of the war in the fall of 1688. Warriors of the Wabanaki Confederacy attacked and killed settlers near Dartmouth and raided a settlement at North Yarmouth, killing 2 settlers. Two entire families were massacred in Kennebunk by raiders from the Confederacy. After a quiet winter, the conflict flared again with an attack on a settlement at Saco. In retaliation for these attacks by the native Americans, a small contingent of 24 local settlers was raised to find the Wabanaki, but they retreated after suffering a loss of more than a quarter of their group in battles with the French allies. The war began in earnest on the heels of these events. Dover New Hampshire was the site of a major raid by Native Americans in the summer of 1689. More than 20 settlers lost their lives and more were taken captive and put on the auction block for New France’s trade in slaves. Later that summer, the fort at Permaquid near present-day Bristol, Maine, was burned to the ground by a war party of natives. All of these events led New England to mount an Acadian raid under the command of Major Benjamin Church. A major figure in King William’s War, Church was in command in four separate forays into Acadia and in retaliation for acts of war by the Wabanaki Confederacy. The first raid was in September of 1689, when 21 of his 250-strong war party were killed by the natives at Falmouth, where an English settlement was situated. He was nonetheless successful and forced the natives to retreat. Unfortunately, the survivors and other settlers in the area were massacred the next spring by troops from New France and their native allies. The reaction to this massacre was an attack on the capital of Acadia, Port Royal, by New England under the command of Sir William Phips. Beginning on the 9th of May in 1690, seven English ships loaded with over 700 soldiers initiated what was called the Battle of Port Royal. The French forces held their own over the course of 2 days but then gave up. The leader of the French, Governor de Meneval, was held captive as were the forces he commanded. The New Englanders proclaimed a victory by destroying the just-constructed fort and forcing the French to declare allegiance to the King. In skirmishes that followed after, Phips vacated the area, the settlement was looted, the church was burned, and the capital of Acadia was relocated to a safer location near present-day Fredericton in New Brunswick. Fort Nashwaak served as the Acadian capital until the war’s end, when Port Royal’s status was restored and the capital was returned there. The second expedition into Acadia by the Church was in September of 1690, when he and 300 troops launched an attack beginning in Casco Bay. 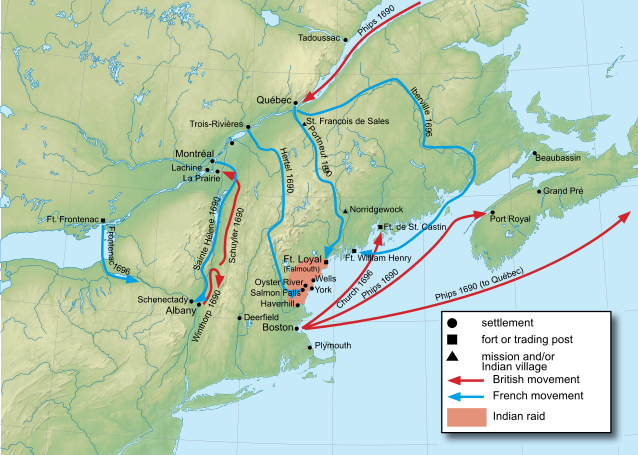 The purpose of this action was to retake an English fort that had been captured and held by the Wabanaki Confederacy. He and his men moved up the Androscoggin River and arrived at the fort in question. In action that followed, Church killed several Native Americans, rescued several English who had been held captive, and made prisoners out of the natives. Reaction to this effort was swift, and in a few days Wabanaki warriors launched an attack on Church at Cape Elizabeth. In the fracas he lost 7 men and had 24 wounded. He and his remaining troops left for Portsmouth in late September. The town of Wells, comprised of around 80 structures and a sizable population, was attacked in the summer of 1691 by a force of Native Americans. Part of the settlement was a garrison with a stockade around it, and this was defended and saved by Captain Converse. The Church’s third foray into Acadia in King William’s War was in 1692. His troops launched attacks on Penobscot and Taconock. In 1693, New England once again raided Port Royal and destroyed some residences and stores of food. For the next 3 years, battles between the major forces on both sides were mostly inconclusive. The Oyster River Massacre and the Siege of Pemaquid preceded Church’s fourth mission to the area in which he attacked the Acadian capital and massacred and looted the settlement. In 1689 a large contingent of Iroquois attacked the settlement of French at Lachine. Numerous English settlements were raided by New France and the natives in the early part of 1690. Two major offensives known as the Quebec and the Port Royal expeditions were undertaken by New England, but subsequent battles were mostly fought by English colonists and were small scale and mostly unsuccessful actions. Peace was finally achieved in 1697 by means of the Treaty of Ryswick. While this agreement effectively ended the ongoing war between the French and the English, it did not hold for long. Conflicts continued, and other wars were fought until the France’s ultimate defeat in 1763.